NO GOLD DIGGINGS. No treasure only a tree stump taken as souvenir according to a reliable source. Photo shows premises of Sta. Monica Parish church in Alburquerque as alleged treasure hunting. Pasish priest Fr. Andy Ayco ordered to stop all unauthorized activities even as U.S. frim was hired by Mayor Efren Tungol to assist LGU in church’s preservation. Currently, Fr. Ted Torralba acts as executive secretary of CBCP permanent committee for cultural heritage of church. The sensational discovery of gold bullion bandied about to be buried under the convent of the 18th century old Santa Monica Church in Alburquerque, Bohol has been the center of wild speculations the past days since it landed in the online edition of the Philippine Daily Inquirer (PDI) turned out to be non-existent. Daniel “Dan” McNames, Managing Director of MicroRadian Engineering, fueled gold fever among the parishioners when he emerged from the backdoor of the parish church, cradling a sack, many onlookers claim was crammed with “1,000 kilograms gold bullion”, in broad daylight. TheÂ ChronicleÂ tracked down McNames to a local hotel where he agreed to an interview on condition that no pictures be taken except for photos of the alleged “gold bullion”. 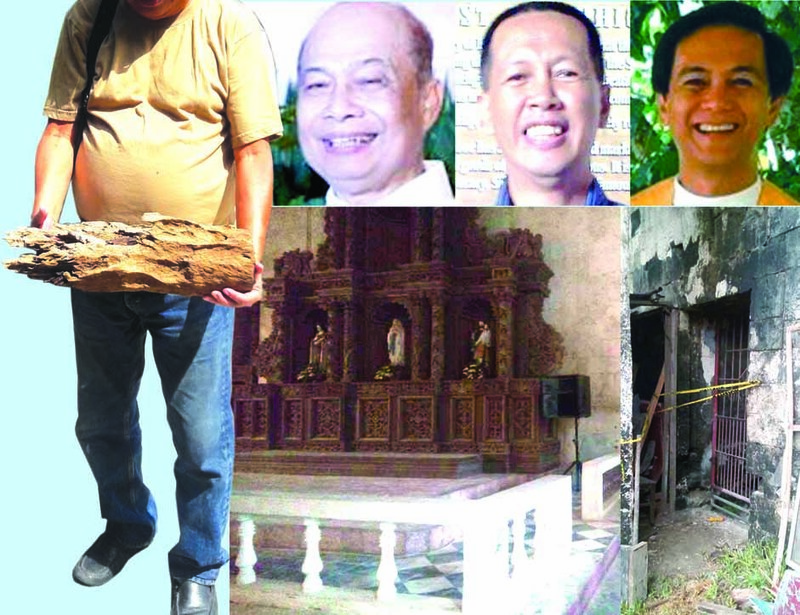 McNames then recounted his involvement in the alleged treasure hunting caper that led PDI contributor Edgar Allan Sembrano to report about a “1,000 kg gold bullion” found by a “village idiot” in a church complex. McNames, sporting long hair,Â in an exclusive interview with theÂ ChronicleÂ doused cold water on the wild rumors saying “there were dug holes of what appeared to me as recent excavations but no treasure, only a tree stump which I took as a souvenir and stuffed it into a sack”. “Can you imagine a 64 year old guy straining with all his might lugging 1,000 kilograms of gold bullion which is nearly 20 bags of rice of 50 kilos?”. “What they thought were gold bullions was an 18th century tree stump weighing 2 kilos, by my own reckoning, that I uprooted in the spot where we were digging and took it as part of my interest as a geologist”, added McNames. McNames allowed photos to be taken of the “century old tree stump”. The titillating story of a “1,000 kilogram gold bullion” found by a “village idiot” was reported by the Philippine Daily Inquirer (PDI) in the paper’s on-line breaking news section on September 19, 2016 by Edgar Allan M. Sembrano, PDI contributor. The PDI article apparently missed out on a footnote on page 4 of a five page progress report submitted by McNames to Mayor Tungol on the reconstruction project of the church on September 14, 2016. “This was my reaction to hilarious stories going around about my gold bullion find”, according to McNames. McNames dismissed the gold furor as “certainly a tempest in a teapot” but unfortunately caused Fr. Andres “Andy” Ayco to take a leave from his duties as parish priest and requested to be transferred to another parish. An investigation was conducted by the National Museum (NM) on the day the news broke out in the Inquirer about the alleged treasure hunting, according to Fr. Millan Ted Torralba. Torralba is the Executive Secretary of the Catholic Bishops Conference of the Philippines (CBCP) Permanent Committee for the Cultural Heritage of the Church. He told the Chronicle during a phone interview from Manila that NM investigator ruled that the alleged issue of trespassing on church property has to be resolved by the LGU and the Diocese of Tagbilaran. Torralba citedÂ R.A. 1006 known as the National Cultural Heritage Act of 2009 specifying the parameters in the restoration work of churches which has made Bohol the “poster boy” in the conservation of churches in the entire country. He recalled that in November, 2014, former Alburquerque Mayor Efren Tungol wrote the Albur parish priest informing him of a seismic test to be conducted by a firm commissioned by the LGU. Fr. Torralba said the strongly worded letter of Tungol stated “your cooperation is needed”. Torralba, who also sits as chairman of the diocesan commission for the cultural heritage of the church was surprised when reports reached him that the supposed seismic test included rituals which are done by treasure hunters. The restoration work was ordered stopped when reports on alleged treasure hunting was conducted by the group commissioned by former Mayor Tungol. He also confirmed reports that McNames also approached parish priests of other parishes to conduct treasure hunting under the guise of seismic tests. Torralba was quoted by the PDI article alleging that MicroRadian’s activity was not covered by a Philippine Institute of Volcanology and Seismology (Phivolcs) authorization and is a consultant hired by the Local Government Unit (LGU) of Alburquerque. Torralba accused the US firm of “undermining the work of the National Museum and blatantly violating church property by trespassing”, according to the Inquirer story. The Sangguniang Panlalawigan is slated to conduct its own probe on the alleged treasure hunting. For its part, the Provincial Tourism Council (PTC) chaired by Atty. Lucas Nunay, during its last meeting on Friday, expressed deep concern on reports stating the need for authorities to implement security measures at the Sta. Monica Church, a popular church venue for wedding rites. In a press statement, Mayor Elpren Charles Tungol categorically denied that “my office was never part of the contract for the rehabilitation and restoration of the Sta. Monica church from the bidding procedures to the award of the contract..”. “I am deeply concerned by the impression created by news reports, particularly brought about by a misinformed contributor of the Philippine Daily Inquirer (PDI), which imply that I and my father are involved in the rumored “treasure hunting” at the Sta. Monica Parish Church in the municipality of Alburquerque, Bohol”. Tungol stressed that the LGU and the office of the mayor “got involved in the project only on August 18, 2016” when 401 Development and Construction Corporation, the winning bidder for the reconstruction project “asked permission to conduct a soil scan in the church premises”. 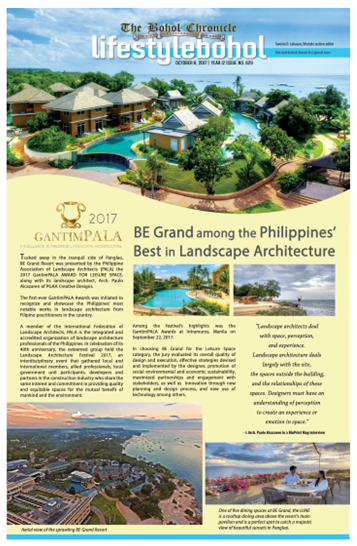 According to Tungol, he did not allow the contractor to do the soil scan until the LGU consultants consisting of civil engineers and geologists will conduct a site inspection “aimed at protecting the cultural heritage of the municipality, nothing less, nothing more”. Tungol also chastised the Inquirer article as a “gross misinterpretation of an allegory written as a footnote” by McNames which was clearly intended to “infuse humor” to the alleged treasure hunting in the church premises. According to McNames, he offered his assistance to then Mayor Efren Tungol to conduct a detailed study for a plan for the stabilization of the town plaza, church and other associated structures on a “pro-bono” basis. MicroRadian Engineering, which he co-founded with two other partners specializes in geotechnical monitoring services in earthquake, volcano and landslide areas. The “pro bono” offer was made by his firm after a “preliminary site walk” conducted on the church, adjacent convent and town plaza showed vulnerabilities to these structures if another seismic activity would occur similar to the 7.2 magnitude that devastated the province on October 15, 2013. The “gold bullion” uproar caused by the alleged treasure hunting led Ayco to vacate his position as parish priest for health reasons as his personal physician advised him to avoid stressful conditions. After the discovery of diggings in the convent, chiseled marks found by parishioners in a wall beside the retablo or altar piece inside the church on September 10, 2016 pushed Ayco to order the stoppage of all activities in the convent to prevent further destruction of the church property. According to Ayco in an interview with theÂ ChronicleÂ thatÂ Fr. Torralba will take his place together with Fr. Justino “Loloy” Estoque, Jr. as his parochial administrator today, Sunday, September 25, 2016. Torralba will assume as parish priest on October 1, 2016. The furor over the gold bullion discovery blew up when Glen Wawinal, a churchÂ carpenter and electricianÂ found diggings inside an empty room in the ground floor of the convent on September 9, 2016. As reported by Ayco, the police confirmed the newly dug holes measuring 1m x 1m in diameter even as the restoration contractor denied their involvement in the diggings. Ayco also told the police that an unidentified white male foreign national sporting long hair “repeatedly entered the convent without their consent and permission before the discovery of the diggings in the convent. The unidentified foreign national turned out to be McNames who admitted that he hired to workers to explore for an entrance to a catacomb or underground cemetery located beneath the convent. McNames told theÂ ChronicleÂ that he was following a lead from long timeÂ residents in Alburquerque who claimed that they personally entered the catacomb through a stairwell in the rectory storage room and pointed at a crumbling floor as the spot where they made their entry into the underground cemetery, according to McNames. The exploration started at 9:30 and was completed at 3PM where two pits were dug and no evidence of a prior entrance to the catacombs was found, according to McNames. But McNames found that there was a prior exploration in the area as evidenced by the presence of flash light batteries, plastic bottles and a BQ mall plastic shopping bag. Meanwhile, theÂ ChronicleÂ learned that Fr. Torralba has requested National Museum NM) Director Jeremy Barns for the inclusion of the Alburquerque parish convent in package 2 of the NM restoration works.